Are you reluctant to go “all in” on social media because of compliance issues? 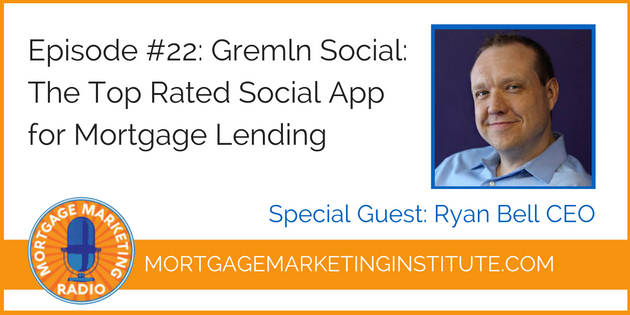 Our special guest for Mortgage Marketing Radio this week is Ryan Bell. Ryan is the Chairman, Chief Product Officer and Chief Technology Officer of Gremln Social, a platform which helps mortgage companies achieve social media compliance. Gremln offers all of the brand monitoring, analytics and scheduling features of other social media management software, but in a compliant manner. What’s more, you can have an existing library of marketing resources, pre-approved by compliance, that are ready to share across your social channels. In fact, Gremln Social has been so well received, that they’ve been endorsed by the American Bankers Association. Gremln’s number one focus is providing the tools to help you streamline your social media marketing needs, save you time & money and make you a more effective marketer. In this interview, we chat about the business aspects of social media compliance in the mortgage industry. In other words, how to be engaged and active on social media in a compliant way.